Mortgage lenders are opening access to credit as mortgage interest rates continue to rise, according to the latest Housing Credit Availability Index from the Urban Institute’s Housing Finance Policy Center. Overall, mortgage credit availability declined to 5.7% in the second quarter of 2018, as the chart below shows. This is down from a peak of 5.9% in the first quarter. However, the decrease was due to a market shift of more buyers moving to the portfolio channel in the second quarter, which has much tighter lending standards. Overall, credit expanded in both the government and portfolio channels. The HCAI measures the percentage of home purchase loans that are likely to default—that is, go unpaid for more than 90 days past their due date. A lower HCAI indicates that lenders are unwilling to tolerate defaults and are imposing tighter lending standards, making it harder to get a loan. A higher HCAI indicates that lenders are willing to tolerate defaults and are taking more risks, making it easier to get a loan. Mortgage credit availability within the GSE channel reached its highest level since its low in 2011. From the second quarter of 2011 to the second quarter of 2018, the total risk taken by the GSEs has more than doubled from 1.4% to 2.9%. The government channel, which includes the Federal Housing Administration, the U.S. Department of Veterans Affairs and the U.S. Department of Agricultural and Rural Development programs, also reached its highest level since 2009 at 11.8% after rising for four consecutive quarters. However, the private-label securities channel remains close to a record low for the amount of default risk taken. The Urban Institute explained there is still significant space to safely expand the credit box. 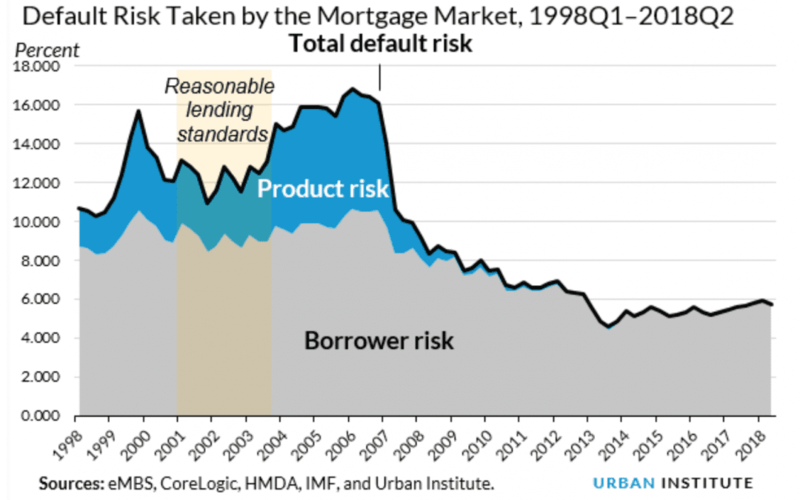 If the current default risk was doubled across all channels, the risk would still be well within the pre-crisis standard of 12.5% from 2001 to 2003 for the whole mortgage market. Some companies are taking steps to improve credit availability within the mortgage market. For example, FICO announced earlier this week that, along with Experian and Finicity, it will release a new scoring model that could increase FICO scores and improve access to credit. FICO Senior Director of Scores and Analytics Joanne Gaskin later explained in an interview with HousingWire that they had two options to expand access to credit: lower the standards or increase the data used to generate the score. FICO chose the latter.